At the recent Facebook F8 conference, Facebook CEO Mark Zuckerberg and developer Bret Taylor announced three new types of plug-ins. How will these new features impact you? How will they impact the internet as a whole? Well already there are some privacy concerns with some of the new features. Facebook is implementing the new “like” or “recommend” button on a lot of popular websites. For example, if you read a article somewhere, you will now see a “like” button at the end of the article. When you click on this “like” button it automatically send the link back to your Facebook account and let all of your Facebook friends know that you either “liked” or “recommended” this story. Well that doesn’t seem too bad. That’s not all, this new feature allows you do do all of this WITHOUT logging in or being logged into your Facebook account. In the past you have to deal with the Facebook Connect page if you wanted to link a story or article to your Facebook page. Well the new “like” button eliminates the need for all that. 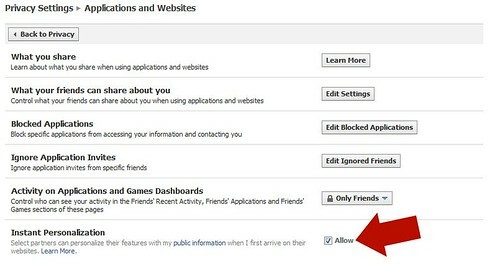 This new feature works as long as you have signed in to your Facebook account recently, with the computer you currently use, then the “like” feature will follow you everywhere. What people don’t realize is that this is now more information that you end up sharing about yourself. Simply put if you end up clicking the “like” button on article about pizza, then that info is then pushed and shared with Facebook now. The end effect being that this newly acquired info will be given to companies and advertisers so that they can personalize ads that will be tailored to your likes and needs. These new “like” buttons are everywhere already, best thing I can suggest, is not clicking on these buttons, and not linking anything to your Facebook page for the time being. These new “instant personalization” features are all turned on automatically by Facebook. Part of the privacy concern is that Facebook is not letting the user decide if they want their personal info to be shared. Before Facebook had to ask the user, not anymore. As I said earlier anytime you decide to “like” a page or article the data will end up being shared with others, this includes your friends. Your friends will now see and view what you like, where you shop, and what you listen to. How is this different from before? Well now it will be all over the web without your permission of where that info will be placed. These new plug-ins that sites can use, will add a news feed to a page and show you what your Facebook friends think of the page your looking at. That page could be restaurant review, or you could be online shopping. You will now see what your friends think, and vice-versa. Facebook is realy trying to shape the way you view your world wide web. They think it’s a good thing, some of us think otherwise. But if you want to “opt-out” of these new “instant personalization” features there are a few steps you must take. Facebook really makes it a difficult process but we have it simplified for you. For now only 3 sites have added the plug-in: Yelp, Pandora, and the new Docs.com. But in the future you will have to un-check any new sites that decide to join the Facebook’s new web revolution. But like I already said, I think it’s best if you avoid the “like” feature all together, and make sure you don’t have any personal info in your Profile, that you don’t want anyone to read, either your friends or now companies and advertisers.